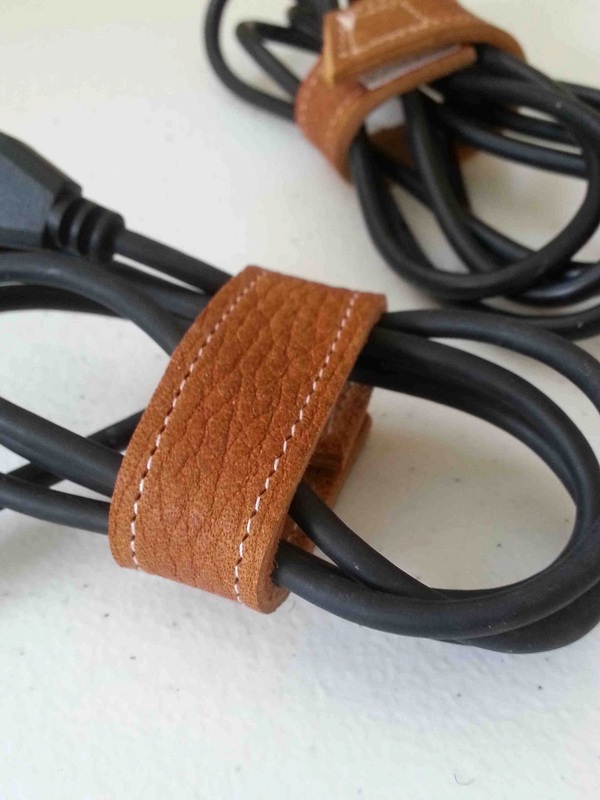 After making up some fabric cord keepers for Mother's Day, I figured that it was time to tackle the problem of unruly cords in a more masculine fashion. Leather is such a great material to work with, and is a great gender neutral material. I love it so much, that I have a really difficult time throwing out leather scraps. I have a whole bin full of small leather scraps, and fortunately, there is plenty to do with them. 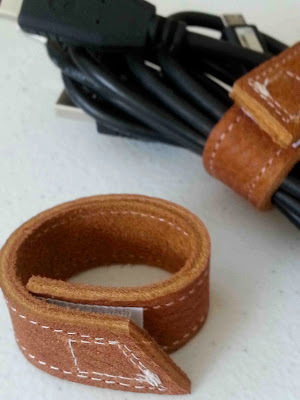 These little leather cord straps require a piece of leather that is only 5/8 inch-3/4 inch wide, and only needs to be about 4 1/2 inches long. I made a few different sizes, just to see what I liked best, and to be honest, the smaller the better, four and a quarter to four and a half inches in length seemed to be just about right for phone chargers, and usb cables. If you need something for a small but bulkier cord, five to five and a half inches would probably work well. Scrap of leather 5/8"x 4 1/2"
Sew On Hook and Loop Fastener (velcro) 1/2"
Take your strip of leather, and sew around the perimeter of the leather using your leather sewing machine needle. Lengthen your stitch length if desired. Sew on your hook and loop (velcro) fastener. You will attach one side to the right side of the leather, and one to the underside, on opposite ends of the strap. Done. If you really want to get organized, you could stamp the name of the cord that belongs to the strap using leather stamps. I had a clever reader mention that she used her embroidery machine to label her fabric cord keepers. So smart. If your leather is particularly thick, or has a difficult time moving under the presser foot, reduce the tension on your presser foot, and use a non stick or teflon presser foot. Is there two pieces of leather sewn together or just one?? Cause it looks like to is why I ask. Great blog, thanks for sharing. this blog is very useful . This is genius! 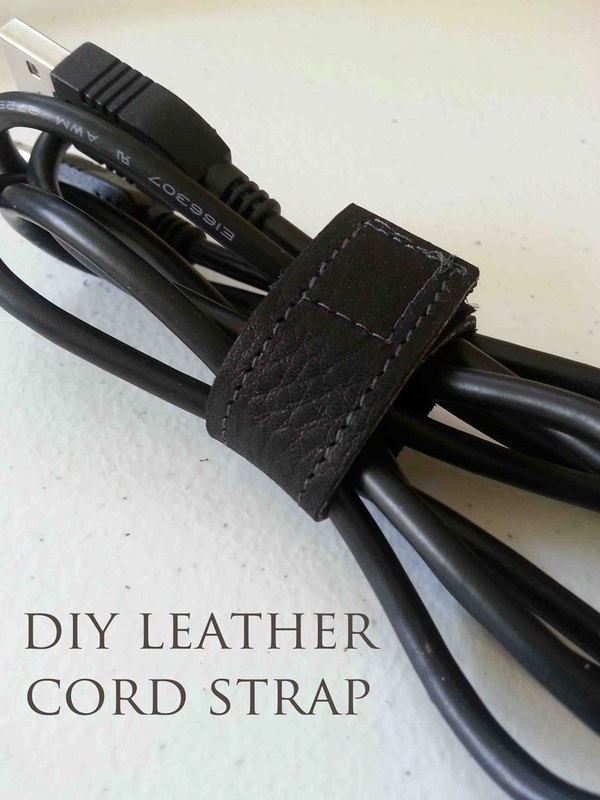 This is definitely something that's going to be useful for anyone out there with spare leather straps. It's very simple to make, which I'm sure anyone who knows basic sewing would be able to do. And more importantly, it can help organize those annoying electrical cords that we have from our cellphone chargers to appliance cords. Thank you for this post!